When San Francisco’s NC2 Studios conceived “Bok Modern” – an innovative line of panels, railings and screens – they selected Airtronics to punch, laser and bend their designs into reality. People rarely use art and sheet metal fabrication in the same sentence, but art is exactly what Airtronics is fabricating for Naylor & Chu Architects. 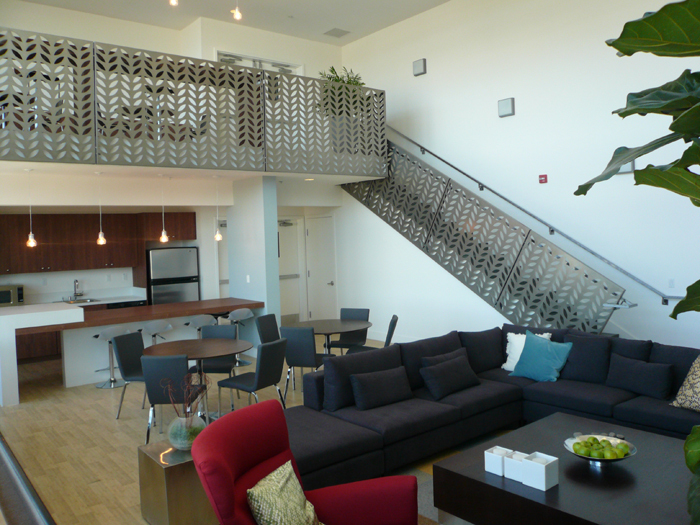 When the San Francisco architects conceived of creating custom-designed metal panels, shades and railings for architectural projects, they selected Airtronics to turn their visions into reality. 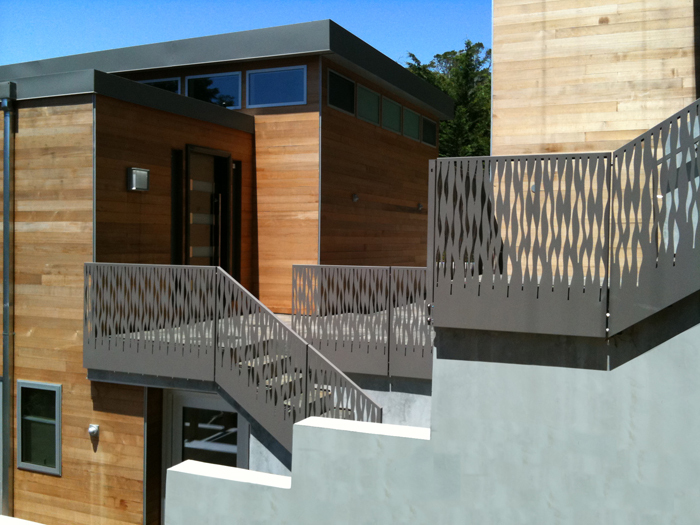 Airtronics’ first architectural projects were a Mill Valley residence and a Berkeley recreation center. 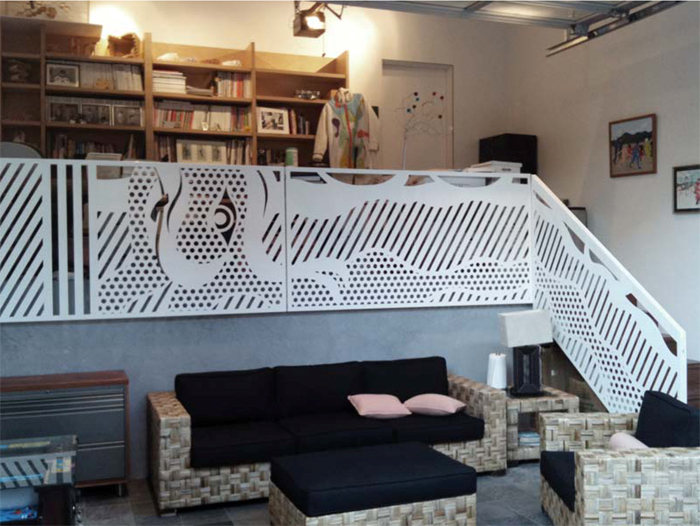 For the residence, Airtronics laser-cut an abstract Lichenstein-like design into panels used on an interior loft and staircase; they also produced custom grass-patterned panels for the exterior balconies and stairs. “We’ve collaborated a lot over the past six months,” Jeff says. “It’s been an exciting venture, and it’s a partnership we hope to continue for years to come.” Other joint projects include a 27-unit condo complex in Hunter’s Point and a San Francisco restaurant/nightclub. Inspired by their recent success, Naylor and Chu launched Bok Modern, a line of decorative metal panels. Noteworthy in their simple, efficient design, the panels require no welding or grinding in their production, and use no posts or brackets for their installation. 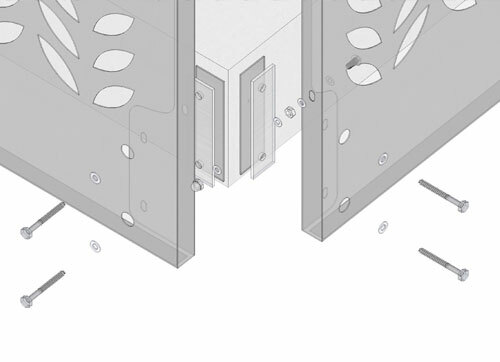 The panels are mounted directly to the base (see illustration). Are you an architect in need of a sheet metal fabrication partner for your next project? Airtronics has the right combination of engineering expertise and state-of-the-art equipment to execute custom sheet metal products for architects, interior designers and landscape architects. We fabricate a variety of metals, including aluminum, cold- and hot-rolled steel, galvanized steel and stainless steel; with finishes ranging from wet and powder paint to anodize and zinc plate. Need help taking your dreams to reality? Got an good idea but no idea what to do with it? We might be able to help, and it only takes a few minutes of your time to find out. Check out our capabilities first to see if we have what you need, then contact us to request a quote or discuss your project.